In the first tentative step toward the final option available for Erdogan to halt the Lira's accelerating collapse - which crashed as low as 7.2362 earlier after the Wellington FX open following the the Turkish president's latest belligerent comments - namely capital controls, the Turkish Banking Regulation and Supervision Agency imposed a limit on the amount of foreign currency and lira swap and swap-like transactions, which are not to exceed 50% of the bank's shareholder equity. Furthermore, new transactions are halted "until current over-shootings mature." Commenting on the swap-transaction limits, Raymond Lee, Managing Director of Kapstream Capital told Bloomberg TV that they will not be enough, noting that "the first step is taking some regulations through the banks and through swap lines is certainly one measure. I don’t think that’s going to be enough." Instead, like almost everyone else, Lee said that interest rates will have to increase substantially to stem the lira’s decline: "I think they’re gonna have to raise it by at least 5-10% so you’re taking the interest rate from 17.75% to 20, 25, maybe even 30%. It just depends on how much the lira continues to fall at the moment." Regarding Turkey as a potential 'Black Swan'-level event, I'm skeptical the collapse of the currency per se would be enough of an incident. The market has known for a while Erdogan was leading the country in an economically reckless direction. The real question was when it all would blow up (although I don't think anyone thought it would go down this quickly.) More specifically, I think that the [EU] banks' exposures to both external debt and local operations, while significant, are not at a crisis level. Where the real risk lies, and one that I think has not been adequately considered, is the markets' reaction to [potential] capital controls. Should Erdogan impose capital controls, in addition to banks' writedowns on [now-toxic] Turkish assets, investors' reaction is likely to be panic and to yank capital out of other EMs before either A. That EM's currency falls further and/or B. That EM's government gets the same idea as Turkey. Separately, in another troubling development, Bloomberg cites an Asia-based FX trader who said that as TRY vol soars "some clients are choosing to watch their own orders rather than leave it with a bank, adding to widening pressure on price spreads." The trader also said that banks are "preferring clients declare their side on deals rather than ask for two-way prices." This may be a reflexive reaction to the pandemonium in the aftermath of the SNB's decision to remove the 1.20 peg against, resulting in massive stop losses and numerous accounts getting margined out. 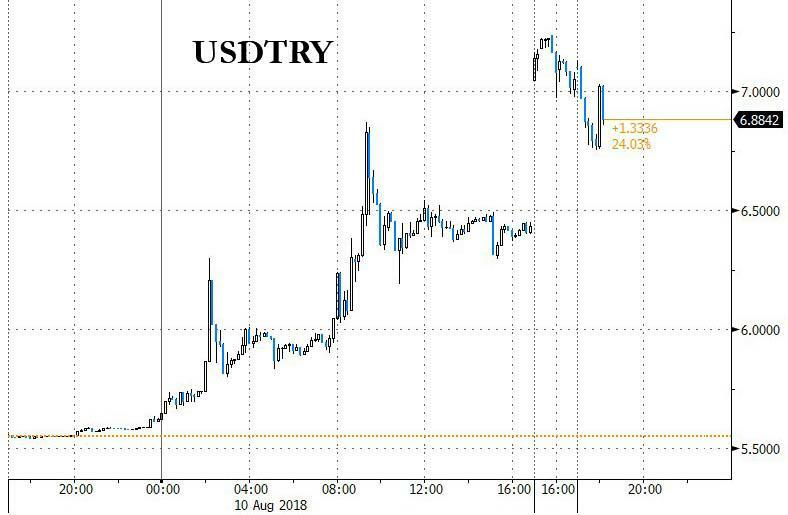 As to what it means for the lira, with Erdogan refusing to even consider a rate hike or an IMF intervention, even as diplomatic ties with the US frayed further when the Turkish president hinted that he would seek "alternative alliances" and had a "weapon" against Trump, whom he accused of instigating the currency collapse, it is difficult to see how besides the occasional kneejerk short squeeze to a headline here or there, the ongoing FX collapse is halted.